It looks like Jim Bunning, the pride of Kentucky, just went out to a local GOP dinner thing and "predicted... that U.S. Supreme Court Justice Ruth Bader Ginsburg would likely be dead from pancreatic cancer within nine months." The context makes it especially odd -- he was telling them that he supported conservative judges. If he thinks he'll be able to vote for a conservative replacement for her, well, good luck. Bunning has gotten a lot of attention recently for resisting the entreaties of GOP Senate leaders who want him to retire. He has a meager $150K in the bank, and Democrats will probably be able to field a top-tier candidate against him. Nate has his seat as our 4th-best pickup opportunity. 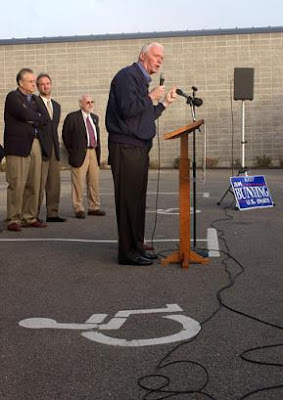 The picture on the right is from late in Bunning's 2004 re-election campaign, which he won by only 1% after erratic behavior that made people worry that age might have eroded his mental abilities. (In a sterling example of Neil picking the close elections that we lose by tiny amounts, his opponent Dan Mongiardo was the one Senate candidate I gave money to that year.) I don't know who his advance guy is working for nowadays, but looking at where he had his boss standing, I'm happy he isn't on our side. Jim Bunning is a donkey's arse. He should be trying to solve our many economic problems, rather than speculating on someone's death. Idiotic!